Most people think being born into a noble family means a life of comfort and wealth. That couldn't be further from the truth for Shuurei Kou. Despite the Kou family being an old and important bloodline, they've fallen on hard times. Shuurei's father works as an archivist in the Imperial library, which is a prestigious position, but unfortunately not one that pays much. To put food on the table, Shuurei works odd jobs such as teaching young children or playing live music in a restaurant―and even then, it's barely enough. The more time she spends in the palace, the more her old dream of becoming a court official is reignited. There's only one problem: she's a woman and women do not become government officials. Shuurei may be able to turn the emperor into a good ruler, but will it be at the expense of her own aspirations? Oh, Saiunkoku Monogatari. I will never understand why this show isn't more popular. But I digress. At first glance, the plot may seem a bit shallow - a girl becomes the consort of a reluctant Emperor, let the silliness begin! - but wow does it become so much more. Essentially, Saiunkoku Monogatari is an engaging drama filled with political intrigue disguised as a simple reverse harem story. Even the simplest details connect to overall story and the plot becomes more and more developed as the show progresses. Not much to say here other than Saiunkoku Monogatari does have an overdose of bishies. Don't let that deter you though. None of the characters are there just for looks. Pretty well done score. Some of the highlights include anytime Shuurei plays the erhu and the OP/ED themes. This show has a lot of characters, but they are introduced slowly and all of the major characters have their backgrounds fleshed out enough. Shuurei is easily one of the best female protagonists I've come across. She has a girl power! attitude that never comes off as obnoxious. Her interactions with the rest of the cast are entertaining to watch. She has a magnetic personality, but not to the point of ridiculousness (Honda Tohru comes to mind). Though truth is, I kind of like all of the characters. Some stand outs include Seiran (one of my top ten favourite characters ever) and Ryuuren with his crazy flute. The plot twists, the characters, the everything. I finished this show some time ago, but I wouldn't mind rewatching it. It's the kind of show where you miss little details the first time around. My enjoyment of this show compels me to give it a 10. The story is just so much more than a little blurb of a summary. The characters really grew on me, the soundtrack added to the mood. The beautiful backgrounds always caught my eye. There's just so much substance to this show - it's not for someone looking for a simple story. Prepare to be sucked into the world of Saiunkoku Monogatari, I know I was. Almost everyone who has seen Saiunkoku Monogatari has compared it to Fushigi Yuugi. Sure, there are similar elements, such as the ancient China setting, the characters\' appearance and of course the reverse harem. However, I think that the thing that links both series the most is that they\'re both really good. The story focuses on Shuurei Kou, a resident of Saiunkoku. She dreams of becoming a government official and throughout the series, we see her chasing that dream, as well as juggling love, friendship and work at the same time. I greatly admire Shuurei, as well as the other women characters in this series. She\'s definitely not like Miaka, personality-wise (she does look a bit like Miaka). She\'s smart, capable, and courageous; She carries with her all the virtues that women should have, and the story focused more on her qualities rather than her appearance (honestly, the boys are prettier than Shuurei). I believe that Saiunkoku Monogatari is one rare anime that portrays how women can make a huge difference in their societies. First you have Shuurei, who defied all odds and emerged superior in the end. There\'s also Sai Rin, who surpassed her male sibling and became one of the heads of the merchant alliance. There\'s Eiki, who refuses to have anyone tell her what to do. Even with the slightly feminist theme, I do believe that Saiunkoku Monogatari can gain a male audience. The male characters are also very chivalrous and noble. My favorite would be Ensei and Seiran. Both of them are ready to give up their lives for the future of their loved ones. There\'s also Eigetsu, who is able to accomplish so much at such a young age. If you\'re not satisfied with that, there\'s always the chinese proverbs that are given in every episode (they double as episode titles). Madhouse never fails to amuse me. I always say that anything Madhouse makes is automatically a must see for me. However, I am a bit disappointed this time. The animation for Saiunkoku Monogatari wasn\'t so impressive (but the last few episodes improved). I noticed that the movements weren\'t so smooth (Fight scenes need work), and I wasn\'t a fan of the color scheme either. It wasn\'t that bad, but it wasn\'t that good either. Voice acting was very interesting. I actually had a chance to see clips of the voice actors working, and it was very entertaining to watch Houko Kuwashima (Shuurei) and Tomokazu Seki (Ryuuki). I think they did a very good job of portraying their respective characters\' personalities. The music wasn\'t that impressive at first either, but in time I started to like it. I even had the lyrics to the opening and ending themes memorized. I guess I didn\'t like it too much because I usually prefer contemporary anime music, but it did fit the theme of the series very well. I think they even used Chinese instruments to produce the music. Truth be told, I usually prefer anime series that are set in modern time and in the real world. The fact that it\'s set in ancient China threw me off at first, but by watching it I was able to see what a gem it really is. It was very entertaining, educational and even funny at times. Saiunkoku Monogatari was able to sway my preference because it is truly an inspiring tale and it should be seen by everyone (And I can\'t wait for the second season!). LIGHT NOVEL, ANIME: Saiunkoku Monogatari was originally a series of light novels written by Yui Sakino and illustrated by Kairi Yura. As of the time of this review, the series is still ongoing, with fourteen collected novels and three side story anthologies. The anime adaptation of Saiunkoku Monogatari was directed by Jun Shishido (well-known for his work on Hajime no Ippou: New Challenger and as an episode director on Beck: Mongolian Chop Squad) and was produced by Studio Madhouse (well-known for their work on Death Note and Dennou Coil). It aired on Japanese TV from April 8th, 2006 until February 24th, 2007. It has been licensed Stateside, first by Geneon, who released it in individual DVDs before it went defunct, and then the license was picked up by FUNimation, who has released both the previously-released DVDs and new DVDs in box sets. The most recent box set to be released will be released on October 4th of this year, and will contain the complete series. The premise sounds like a set-up for wacky reverse harem hijinx, right? Well, it’s actually a lot deeper than that. 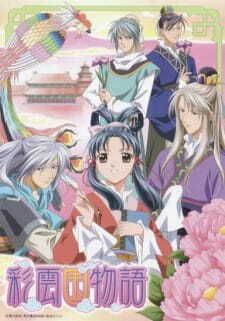 The wacky hijinx exist prominently for the first six episodes or so, but after that, mostly they take a backseat to the politics of Imperial life and running a country, and to Shuurei’s personal struggles, both to try and become an imperial official, and with her relationship to the two main men in her life – her bodyguard and the emperor. Shuurei herself has to be one of the most well-characterized females I’ve seen in a series since Balsa in Seirei no Moribito. She is a woman, yes, but she is there first and foremost to do her job, be it making the Emperor into a better ruler or doing work in the Palace archives, and while she puts on a strong, bright, cheerful façade, she has her moments of weakness, which make her incredibly human. There are also several major and minor characters in here, an incredibly large cast to keep track of in general, even over the space of thirty-nine episodes. However, each of them is given a distinctive character and enough screentime and basic development to for the audience to be able to recognize them when they’re on-screen. The plot is incredibly well done in how it moves – each episode contributes some minute detail to intrigues in the Palace and the empire, and towards Shuurei’s larger goals of becoming an official, and almost every detail that one can think of is wrapped up by the end of the series. The detail of the world is also incredibly well-thought-out; the minutest details of governance are explored, even if they are pretty heavily based off of the Chinese/Japanese imperial systems. However, the rate at which the plot moves can be so incredibly slow at times that it can drag along for several episodes, and can cause easily bored watchers to drop the series. I myself have a fairly high boredom threshold, but even I would have gaps of three to five days between episodes at times, because I simply didn’t want to watch it (mainly after eight to ten hour shifts at my workplace). Granted, staying with the series, even through the more boring parts, pays off in spades towards the end of it. ART: The character design for this series is incredibly well-done. With such a large cast, each character has to be given a distinctive appearance, so that they don’t simply fade into the background. The design team does this quite well, in addition to producing well-drawn characters, and even had enough budget to give them all a few costume changes here and there. Backgrounds obviously have a strong Chinese and Japanese influence on them, yet the background team manages to make them look reminiscent of existing styles, yet original enough for the backgrounds to stand on their own ground. Very well done art, the kind of quality from a Madhouse production that I’ve come to expect. MUSIC: The soundtrack for this series heavily features the erhu (or niko, depending on on whether you’re going by its Chinese or Japanese designation), a two-stringed instrument that the main character plays. Otherwise, the soundtrack is fairly Japanese-influenced, with a lot of native instruments, and pretty well done. It’s not anything I’m going to go out of my way to find, but it’s a solid soundtrack. SEIYUU: The Japanese voice actors did a very solid job on this production; none of the voices were annoying, or seemed mismatched to a character. There weren’t any voices that particularly stood out, either, though. LENGTH: At thirty-nine episodes, you do need to be able to be in for the long-haul on this. The length gives the plot room to breathe and for every character in the cast to get adequate development, but, as I said before, it can and will get boring at points, and if you have a low boredom threshold, you may find yourself wanting to drop it. However, I do recommend sticking with it, as it does pay off in the end. OVERALL: A solid show with one of the best female characters I’ve seen in a long time, well-designed characters and backgrounds, solid soundtrack and Japanese voice actors, and a long length that allows for good character and plot development, but can, at times, get a bit boring. Many people say Saiunkoku Monogatari is like Fushigi Yuugi. I, however, find them very different. Fushigi Yuugi is more fictional and serious, while Saiunkoku Monogatari will almost always have you cracking up and is completely realistic. They do both have female main characters that work hard to achieve their goals though. Speaking strictly about Saiunkoku Monogatari, there is an overall plot that contains many shorter stories within it. One of the best things about this series is that it seems spontaneous - one event leads directly to another. However, this shift is never fluid. There are always obstacles that the main character - Kou Shurrei - must overcome. In that sense, it's much like real life. One of the most consistent obstacles is her being a woman in the &quot;men's world&quot; of politics. Another main impediment that we can perhaps relate to better, is love. The many men that Shurrei comes across causes her to weigh the importance of work versus love. Being a 17-year-old girl, she is easily confused, and what she decides to do in terms of her relationships is quite a suspenseful part of the anime.